Metal Face Seal is a special type of mechanical seal. They are also known under other designations such as lifetime seals, floating seals, duo-con seals, toric seals And heavy equipment seals. By designating the metal face seal to the equipment, we look for the quality and reliability of a sealing solution that works reliably over time. And there is a good reason: the seal is deeply integrated into the machine or machine system, so the breakdown is not an option. 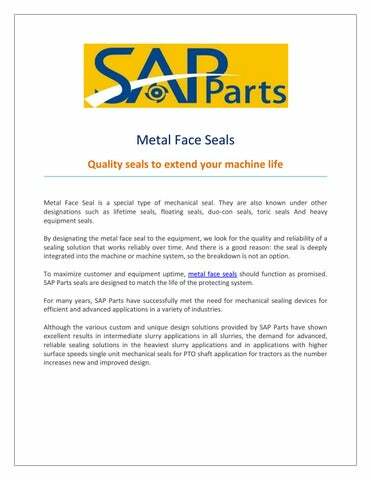 To maximize customer and equipment uptime, metal face seals should function as promised. 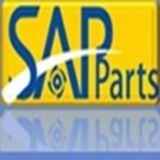 SAP Parts seals are designed to match the life of the protecting system. For many years, SAP Parts have successfully met the need for mechanical sealing devices for efficient and advanced applications in a variety of industries. Although the various custom and unique design solutions provided by SAP Parts have shown excellent results in intermediate slurry applications in all slurries, the demand for advanced, reliable sealing solutions in the heaviest slurry applications and in applications with higher surface speeds single unit mechanical seals for PTO shaft application for tractors as the number increases new and improved design.